Retired General Sarath Fonseka was yesterday summoned to appear before a second General Court Martial (GCM) on Tuesday to face charges of fraudulent activity, 48 hours before he stands as an opposition candidate at parliamentary general elections. A copy of a convening order for this GCM was handed over by Military Secretary Major General Chrisantha Silva, yesterday afternoon to Gen. (retd.) Fonseka at the annexe where he is being held at Navy Headquarters. He has been told to appear before this GCM at 2.30 p.m. The order signed by President Mahinda Rajapaksa (as Commander-in-Chief of the armed forces) names three members for this GCM. As exclusively revealed in last week’s Sunday Times, it is headed by Major General Milinda Peiris. The other two members are Major General Lalith Daulagala and Major General Mahinda Hathurusinghe. The directive for retired General Fonseka to attend a second General Court Martial on Tuesday came as four members of the Buddhist clergy and civilians began a fast unto death outside the Fort Railway Station. The Fort Police last night dismantled the makeshift structure that sheltered the fasting protesters and ordered them to leave the area. But the protesters defied the police order and remained there. A senior police officer said they had obtained a court order to evict the protesters and would take action against them if they failed to move out. “This is not the place to carry out a fast,” he saidEarlier police said the protest was a violation of polls laws. General Fonseka is a Democratic National Alliance candidate for Thursday’s general elections for the Colombo district. He contested President Rajapaksa at last January’s presidential elections as the common opposition candidate. He was taken into Army custody shortly after the election. On Tuesday morning, the General Court Martial appointed to probe conspiracy charges against Gen. (retd.) Fonseka will resume sittings. It is headed by Major General Harsha Weeratunga. The other members are Major General Lalith Wijetunga and Major General Aruna Jayatilake. 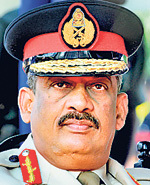 In the first GCM, General Fonseka faces three charges and in the second court two. When the first GCM met on March 15, counsel representing Gen. (retd.) Fonseka raised objections to the composition of the court and argued his arrest was illegal. It is not immediately clear whether the Court would give reasons on Tuesday why it over ruled the objections. The International Committee of the Red Cross said yesterday it would intervene on behalf of former Army Commander and Presidential candidate retired General Sarath Fonseka. The move follows an appeal to the ICRC by Anoma Fonseka, who has alleged that her husband is being detained at Navy headquarters in conditions that are harmful to his health. An ICRC spokesperson confirmed the group had responded to a request of Ms Fonseka. Ms Fonseka told the Sunday Times that the ICRC had personally delivered a note to this effect on Friday evening to her at her Queens Road residence. “The ICRC has requested me to meet its officials at the earliest to discuss measures towards providing proper medical assistance to my husband whose health is on the decline,” she said. ICRC spokesperson Sarasi Wijeratne said, “We have received the request from Ms Fonseka and there are developments regarding this”. Ms. Fonseka said she had earlier written to Army Commander Jagath Jayasuriya and three Navy doctors were detailed to examine Gen. Fonseka, but they were not specialists. “He needs more walking exercises and to breath fresh air,” she said. Mrs. Fonseka said her husband was suffering from acute respiratory problems and was having a regular cough with his throat being sore. “Sometimes it is difficult to understand what he is trying to say,” Ms. Fonseka said. She claimed defence authorities had turned down repeated requests to have her husband’s condition checked by specialists who were aware of his case. The military spokesman said the former army commander was being examined by suitable and qualified navy doctors and according to their reports, he was in good health. Meanwhile General Fonseka’s daughter Aparna Fonseka is scheduled to arrive in the country today to visit her father. Can the trophy save the General?